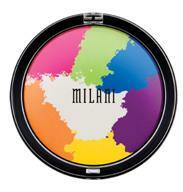 Milani presents its hottest and brightest shades that complement every summer glow. STOP! Wardrobe change? No problem, create a gallery of nail looks with Milani’s New Limited Edition High Speed Fast Dry One Coat Formula Nail Lacquer – fast and luxurious, to get you on the GO – their new flat brush for fast and flawless application that dries in 60 seconds. For an additional pop of color use Milani’s High Speed Fast Dry One Coat Formula Nail Lacquers for extreme shine and electrifying nails. These high voltage bright pigments are available in eight high fashion shades and great for the summer season! Available Shades: Purple Rush, Instantaneous Blue, Racy Green, Fast Fuchsia, Jiffy Orange, Violet Dash, Yellow Whiz, & Hot Pink Frenzy. Brighten your lids with Milani’s Limited Edition Paint Eyeshadow Palette---fashion forward neon colors in one super-soft, silk-like application. Brighten your eyes by using shades separately or swirled together to create your own unique hue of art. Limited Edition Items available ONLY the month of July at select CVS drug stores. ‘LIKE’ MILANI COSMETICS ON FACEBOOK OR FOLLOW US ON TWITTER! I thought they were about due to put out something new. I'm still hoping to see the Vintage re-release in stores but might have to break down and just buy the ones I want online. Love the look of that shadow. Wonder what it looks like when applied? All the polishes look pretty but nothing new.